← THE POWER OF PRAISE! 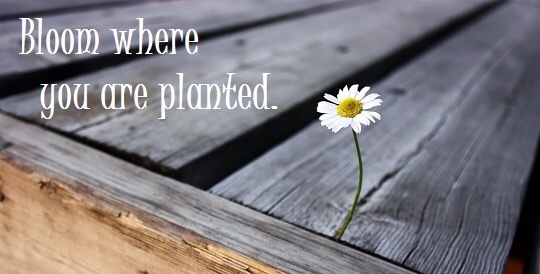 OBSERVATION: Have you ever heard The expression – “Bloom where you are planted!” This is a concept that seems to have been lost in our present culture. Marketing experts pine away for hours trying to convince us that we cannot be satisfied with the home we live in, the car we drive, the job we work at, the clothes we wear, or the electronics we use. At the first available opportunity we are convinced that we need to throw it out or trade it in. If we live our lives like this we are caught on a never ending cycle of discontentment and disappointment. These verses, and this sideline of instruction in Paul’s treatise on marriage, was not written to condone the practice of slavery. It was written however to remind all the Corinthians believer’s of the true source of their freedom to live their life with purpose and faithfulness. Our freedom, our purpose in life, our personal fulfillment, is not determined by anything that is without – but wholly and fully by what is within. True freedom is not the absence of something, but the possession of something. True freedom comes from the indwelling presence of the Holy Spirit in our lives through faith in Jesus Christ! Some old fashioned advice that never goes out of style! This entry was posted in I Corinthians. Bookmark the permalink.